"Of Heaven And Earth". 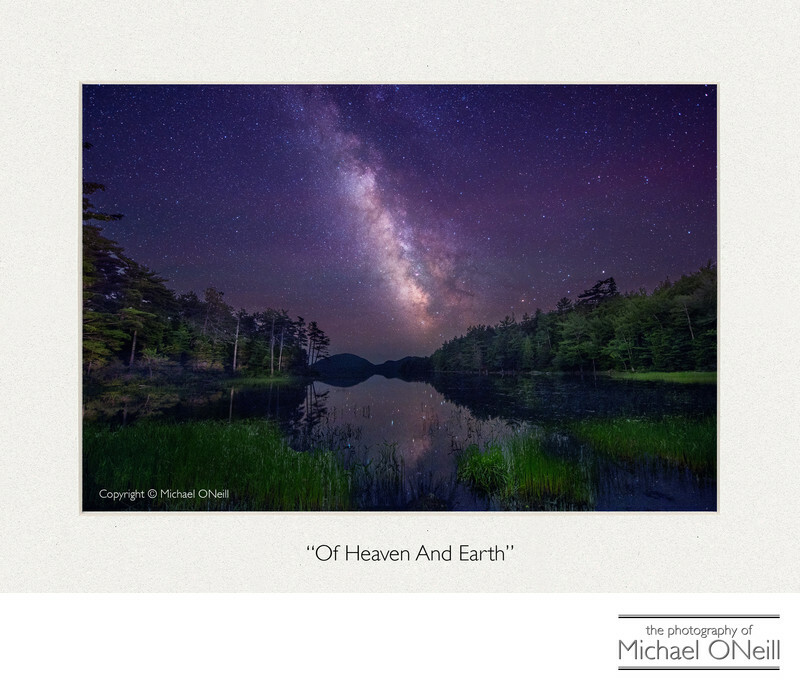 One of three night sky, Milky Way images in my body of fine art photography editions. This one was created on the shore of Eagle Lake, located within Acadia National Park on Mount Desert Island at Bar Harbor, Maine. This image was captured on a Nikon D810A camera...a camera designed specifically for the specialized purpose of astrophotography. Through my close alliance with the folks at Nikon USA I was able to get my hands on one of these amazing cameras prior to it’s release to the general public. I threw it in my camera bag, along with the Nikkor 14-24MM f2.8 zoom lens and headed off on my motorcycle from my home on Long Island, NY towards the darkness of the new moon of down east Maine. I elicited the aid of a local guide to find my way around the park in the pitch darkness and Eagle Lake was our second stop of the night’s adventure. Elsewhere in this gallery you will find other Milky Way images created at Otter Point and Sand Beach, also within the boundaries of this magnificent National Park. You may acquire "Of Heaven and Earth" artist-direct, along with any of my other collectible fine art photography editions, through the links on this web site. They are also offered to collectors through various fine art galleries that represent my body of work.